Soul Sisters is an example of a deck where I’d expect designers to be rather cautious about how and where they make new cards for it. Gaining life continuously turn after turn after turn is simply unbeatable for a few decks, and draws the game out beyond the point of fun for others. Resplendent Angel is a good sort of design, though, because it actually moves the game towards a conclusion of some sort. From the point of view of its controller, it also provides a good payoff even if you can’t string together a bunch of turns where you gain five or more life, because even one 4/4 flying token is a threat that must be dealt with. Its ability to transform into a huge game-ending creature is obviously good for the Soul Sisters class of deck, but also means that its appeal is not limited to that class, which is a good thing all around. Now, this is an interesting mythic rare. Life gain decks are often derided for doing nothing until they die, which is true! They usually die slowly, hoping to win largely through attrition. Resplendent Angel gives you something for gaining all that life in a turn: if you gain 5 or more life in a single turn, you get another Angel. And this is for every turn. If you have a way to gain life on other turns, you can flood the board with Angels. 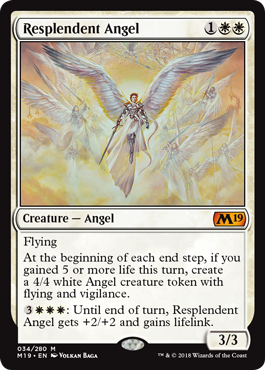 Resplendent Angel is also able to turn on on its own once you get to 6 mana, as swinging a 5/5 with lifelink is pretty efficient in that regard. Resplendent Angel is a potentially powerful piece, though that 3 toughness is concerning, right in the sweet spot for burn damage. As a three-mana creature, though, it’s not an exorbitant investment, and it can pay dividends if you’re in a deck suited to enable it. Or it can just be an efficient winged perversion in decks without the shell. Your call!